This popular houseplant is easy to care for and is renowned for growing well in dim light. It is an ideal office plant, bringing some visual interest and air filtering qualities to a space even with no natural light at all. This plant will happily live its life in the shade with its only source of light being artificial light. This plant enjoys moist soil. Water it thoroughly, but ensure it's allowed to dry out between waterings, and never let it sit in wet soil as this will result in root rot, usually killing the plant. A well-draining soil is recommended for this plant to allow excess water to drain downwards and out of the bottom of the pot. A mixture or soil and perlite, or even some orchid bark mix would work well. Ensure you plant your Chinese Evergreen in a plant pot with holes in the bottom so that excess water can be drained and tipped away. One way of doing this is to double pot your plant by using a plastic plant pot with draining holes, and sit that in an ornamental pot without holes. This works well because you can simply lift out the inner pot and empty the drained water away. Alternatively, you can use a single pot with drainage holes in the bottom. Soil very rarely escapes out of the bottom, though if you're worried about this, you could place a coffee filter inside the pot before you plant the Chinese Evergreen in it. This will prevent any soil from leaking out, but will still allow water to drain through. Drainage holes are essential as this plant will not do well when sat in waterlogged soil. Some people believe you can get away without drainage holes by filling the bottom of the pot with rocks or large pebbles, then layering soil on top. The premise of this is that water drains through the soil and then, sits in the bottom of the rocks, preventing the roots from sitting in water. Though in theory, this might sound like a good idea, it rarely works in practice. Soil is absorbent and good at holding water, much like a sponge. The soil will actually retain as much water as possible, not letting any water go through to the rocks until it is completely saturated and unable to hold any more. This will be bad for the roots of your Chinese Evergreen, and could result in root rot and a very unhealthy plant. Root rot is very difficult to recover from, so the best course of action is to prevent it with well-draining soil, a pot with drainage holes, and making sure not to overwater your plant. The Chinese Evergreen can be watered once the top inch or two of its soil has dried out. You can check this before you water by simply dipping a finger in the soil. If it is moist to the touch, then wait a few more days before testing it again for watering. This plant is fairly resistant to drought-like conditions, so it will be able to cope perfectly fine in slightly dry soil, though do not leave it without water for long periods of time. Though this plant is easy to look after and is very undemanding in terms of its needs, the one caveat to this is temperature. This is a warmth-loving plant, and would ideally like to be in a temperature range of 65-80° F, with 60° F being just about the lowest temperature it will tolerate. Keep the plant in a warm part of the home away from windows or doors, where it might suffer as a result of cold draughts. Also, keep it away from any air conditioning units or fan heaters, which will quickly dry it out. The Chinese Evergreen plant will not thrive if left in a little-used area of the home that doesn't benefit from constant heat, such as a rarely used guest room or a cold conservatory or porch. Treat the Chinese Evergreen almost like a member of your family; keep it in a nice, warm space where it will be comfortable and reward you with lots of beautiful lush foliage. 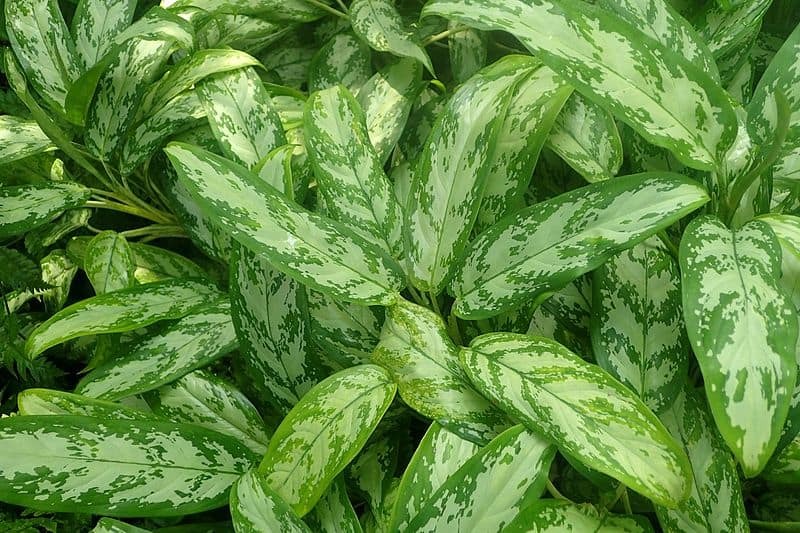 As a tropical and sub-tropical plant, the Chinese Evergreen enjoys moderate to high humidity. It will do fine in normal levels of humidity found in homes but would benefit from a light misting of water to increase humidity. You could also place your plant on a pebble tray with water on it. As the water among the pebbles evaporates, it increases the humidity of the air around the plant. In its natural habitat, when the humidity is especially high, the plant will absorb moisture through its leaves. In times of very dry air, make efforts to increase humidity so that the health of the plant doesn't suffer. Keep it away from draughts or heaters, which may cause the plant to dry out (Southern Living). The Chinese Evergreen is well-known for being a low-light plant, which is why it is particularly popular in offices with no windows. It will do well in shaded areas, though it can cope with moderate indirect light. It does not like to sit in direct sunlight, so do not house the plant on a windowsill or in the line of direct light. This plant will enjoy living in shaded areas of the home and is particularly good at livening up corners of your home where most plants cannot usually live. This plant will need to be re-potted at least every two years. Choose a pot no more than two sizes bigger than its current pot; a pot which is too big will cause problems for the plant because having a lot of soil around it that retains water will lead to the plant inadvertently getting soggy roots, which could lead to root rot. Re-pot the plant by gently removing it from its current pot, and lightly separate the roots from the soil it currently sits in. At this point, it is an option to separate the plant into two halves and pot it up as two smaller individual plants. This is a good idea if your plant is getting too big and you would prefer to have several smaller plants. Alternatively, you could gift the second plant to a friend or family member. 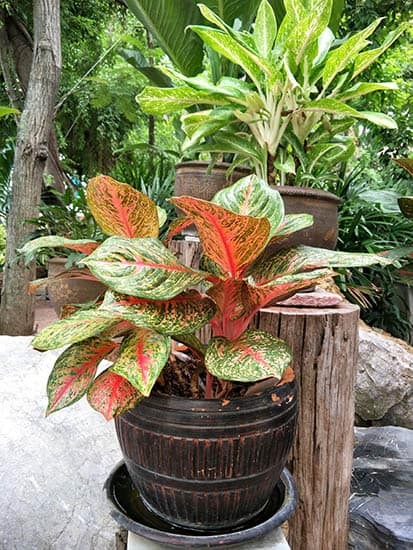 The Chinese Evergreen plant makes a wonderful gift due to it being so easy to grow, having an appealing look about it, and also being a sign of fortune and good luck in China. If you intend to separate the plant into two when you repot it, ensure that you have multiple stems above soil level that can happily be split apart. Providing your roots are not pot-bound, then pulling the roots apart to create two new plants should be fairly easy with little harm caused to the roots. If the plant has been sitting in its current pot for too long, then the roots may have become quite tangled and heavily bunched together. This does not mean that you can't separate it into two or several plants, but just that you need to exercise more care not to injure the plant. Use a gentle touch to lightly untangle the roots; shaking them gently may help to ease the process along and free any bits of soil that are holding the roots together. If the roots were heavily laden together, then expect some damage when separating them, but if put in the correct environment in their new pots, then they should recover well. Alternatively, if your roots are so entangled that they look too daunting to tackle at this point, repot the plant as a whole in a larger pot, allowing the roots space to spread out. In a few months’ time, make another attempt to separate the plant into two and repot. After having space to grow outwards themselves, you may find that they have naturally untangled themselves. Re-potting your Chinese Evergreen has several benefits. It allows the plant more root space, therefore giving it the opportunity to grow and flourish further. Re-potting also gives the plant a refresh in terms of its nutrient environment. Fresh soil will be nutrient dense, giving the plant a nutrient boost (Iowa State University- Horticulture and Home Pest News). The need to prune this plant will very much depend on the look you would like to achieve for it. If you are not a keen gardener and have little interest in pruning the plant, then it isn't necessary to do so. You can let it grow as it pleases, simply removing dead leaves as needed. If you would prefer to keep the plant compact, you can do this by cutting back the plant as necessary. The plant will naturally grow upward, but you can encourage it to grow in an outward direction if you wish by continually cutting the leaves back. 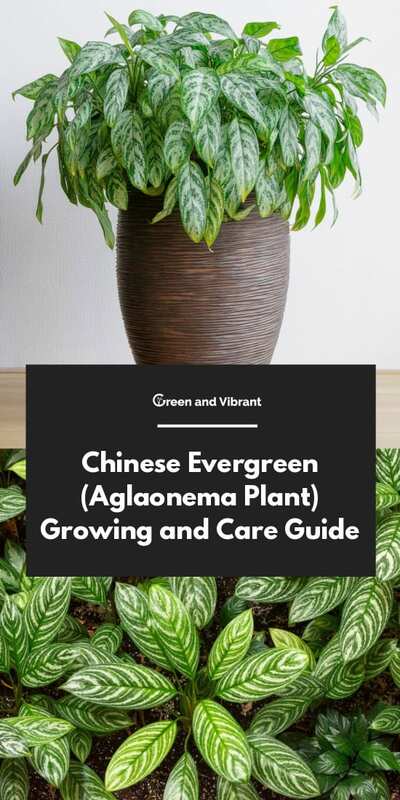 This will result in a bushier-looking Chinese Evergreen as the plant directs its energy toward growing new leaves where the old ones were cut, instead of putting energy into growing the main stems. Propagation can be done with stem cuttings from this plant, although a more popular way to create new plants from the Chinese Evergreen is to split it into multiple pots from the roots as it grows. To propagate from stem cuttings, you will need to prune a stem from the mother plant, which is several inches in length. Plant this in soil, using rooting hormone if you like to encourage root growth. Stem cuttings from this plant also grow well in water. Place the cutting in a glass of water and watch as roots begin to emerge over the period of several weeks. Once it has a strong root system, you can plant it in soil. Planting your cutting in water is now only an effective way to propagate, but it's also a very interesting way to watch how the roots develop. This would be an excellent science lesson if you have children and a great way to get them interested in plants. Stem cuttings will need heating from the underneath to root well. If this isn't possible, choose to propagate in late spring or summer when temperature conditions are more favorable and your plant will be naturally warmed up in your home environment. Propagation by separating a mature plant into two or more plants is a much easier way to derive several plants from one. It's also instant, with the added benefit of preventing the mother plant from becoming too overgrown. To achieve this, simply remove the plant from its pot, gently separate the roots to divide the plant up, and then, repot the ‘new’ plants in smaller pots. This plant has white striated green leaves growing from green stems. It is excellent at removing toxins from the air and was listed among NASA’s top ten plants at filtering the air (NASA Clean Air Study- Interior Landscape Plants for Indoor Air Pollution Abatement). This dark green plant is especially good at dealing with low light, making it an especially good choice for dark offices. 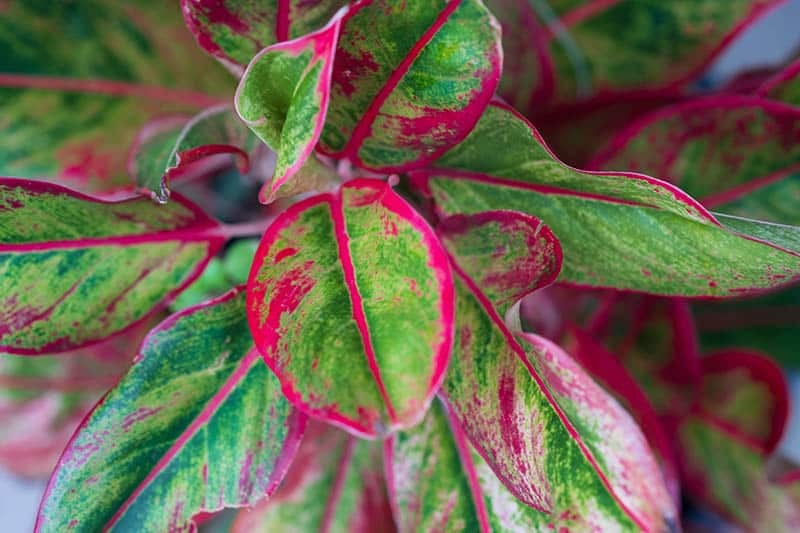 Siam Red-Aglaonema or Siam Aurora has bright pink veins, giving it a very tropical look. It requires a little more light than other cultivars, though will still need to be kept away from indirect light. This variegated plant has a combination of dark and pale green leaves. Its colors remain lush even in very low light, which is unusual for variegated plants. It's ideal for dark offices where the only source of light is fluorescent lighting. This plant features cream-colored patterns on a green base, and is by far the most popular and widely seen variety of the Chinese Evergreen. It is easy to care for, thriving in both low and moderate lighting. Similar to the Silver Queen, the Silver King has green leaves with some cream variegation, though the markings on it are less frequent. This houseplant is very popular due to its bright pink, veining which is more tolerant of low light than other pink-veined varieties. This popular cultivar has green and yellow leaves with pink veins. It should be kept away from indirect light; otherwise, the colors will become less vibrant. Yellowing leaves are usually a result of overwatering. Test the soil of your plant before you water it, and only proceed if the top layer of soil is dry. This plant doesn't like to sit in constantly moist soil and should recover well when allowed to go a little dry between waterings. If you have not been overwatering your plant, then yellow leaves could point to a copper deficiency. This is a very copper thirsty plant, and so copper deficiency is a common problem with the Chinese Evergreen. To ensure it is getting the nutrients it requires, fertilize it at half the recommended strength every month throughout the growing season, every other month during autumn, and not at all during winter. You should also repot the plant as needed, where it will benefit from nutrients in the fresh soil. Browning leaf tips in this plant are usually caused by a buildup of unwanted minerals, such as fluoride from tap water. 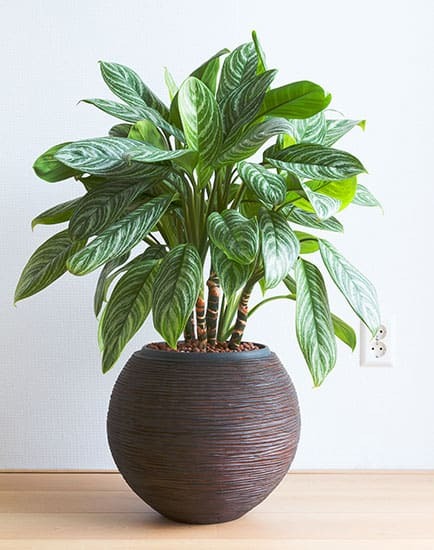 Being a fluoride-sensitive plant, water your Chinese Evergreen with distilled water or water collected from the rain if your local water supply is heavy in fluoride. If the buildup of minerals in your soil from past watering is the issue, repot your plant in fresh soil and continue watering in low fluoride or fluoride-free water. Did you enjoy learning about the Chinese Evergreen? Which variety do you like best? Let us know in the comments below, and don’t forget to share this growing guide with others who may be interested!